Heather Menzies speaks about the White Poppy movement at Occupy Ottawa in November 2011. Oxfam’s recent report, Working for the Few, on one per cent of the world’s population controlling most of the world’s economic power got me thinking about the relevance of the Occupy Movement, and why perhaps now would be a time to revive it. The movement served notice on the moral danger of such deep inequalities: when even the hope of common-good consensus collapses into a them-versus-us divide. But equally, the occupiers brought the issue down to earth. One of the little-discussed truths about the escalating concentration of wealth and power is how ephemeral it is. It’s centred in the information systems running the post-industrial phase of the global market economy. It’s in the trillions of dollars and related influence vested in stocks, bonds, loans, mortgages, derivatives and other largely unregulated financial instruments. Quite apart from how insulated the wealthy can be, there’s the fact that the power they wield, relentlessly, 24-7, is through symbols on a screen, far removed from the impact those symbols have in real life, on the ground. The impulse of the Occupy movement was brilliantly intuitive: to bring home the truth of what it means to real people through the simple act of real people coming together in real time and space, starting with Wall Street. Through their words and actions, they bore witness to the inequalities, the marginalization, the sickness and stress that ordinary people experience every day as they live out the realities of a global economy being driven faster and harder through a combination of digital networks plus deregulation. That impulse could be extended further: to bring home the climate crisis as it’s lived out now by inhabitants of specific habitats being affected. Perhaps it’s time for the people involved in the Occupy movement in various cities and towns to form common cause with people in what’s largely defined as the environment movement. When they do, hopefully they can share the lessons of what they learned about living responsibly within earth’s habitats from when they occupied the habitats of city parks. 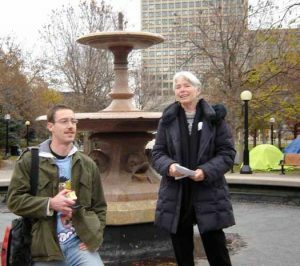 I showed up periodically at Ottawa Occupy, which had taken over a lovely park in downtown Ottawa. I came mostly to bring food and to express my solidarity. But I also spoke to the young men and women who were running the kitchen and organizing the daily general assemblies, and I paid attention. I noted how much energy and time they put into cultivating mutually respectful relations in the running of the camp. I noted how well they were taking care of daily business and taking care of the park itself. It reminded me of the pre-modern commons I was currently researching for my new book, Reclaiming the Commons for the Common Good. The general assemblies, I told them, didn’t just date back to the township meeting practices of New England (and Upper Canada too). They harkened back to the self-governing practices of the commons which were still being extinguished (by the Enclosure Movement) when many of the early ‘settlers’ came to North America. Then, though, the scope of self-governance wasn’t just the social habitat. It was the social and the natural habitat together, with self-governance geared to the mutual sustainability of both habitat and inhabitants. That’s why the commons is a useful heritage to draw on today. This entry was posted in Activism, Author and tagged Canada, commoning, commons, inequality, movement, Occupy, Ottawa, Oxfam by Peter Moore. Bookmark the permalink.